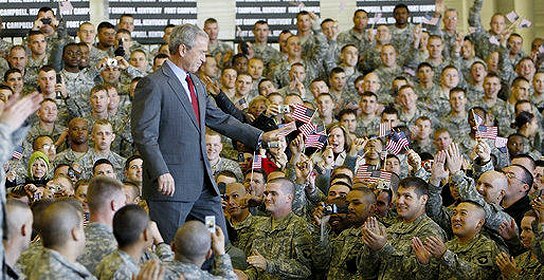 President George W. Bush as he enters the staging area Tuesday, Nov. 25, 2008, at Fort Campbell, Ky., home of the 101st Airborne. You won't see Obamammy doing this. It's just not his way. I'll wager to bet that the White House won't have Christmas decorations either while he's in office because it might offend the Jews and Muslims. 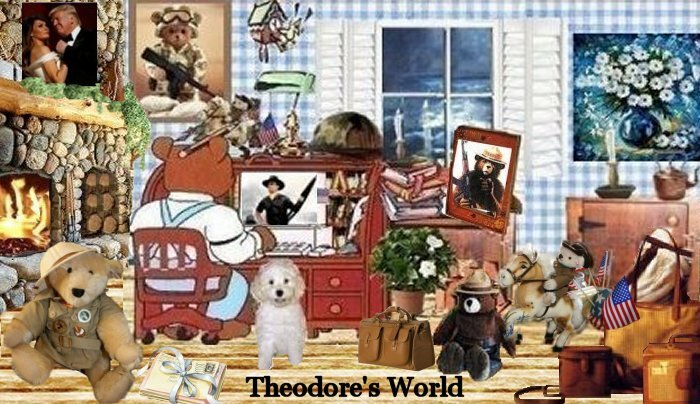 We looked forward to the Presidents Christmas Card every year while Bush was in office. The Obamas won't be doing that either. Oh Lord, we elected one of those "PC" Presidents. The Obamas don't even celebrate Christmas or go to church on Sunday. Exercise is more important than two hours one day a week for God. How sad. At least watch Mass from Notre Dame or Mass for Shut ins or one of those many church shows on cable. He should do something for God because it was through God's good graces that he won and he should be kissing God's feet for his success because NO success comes without God being there first. 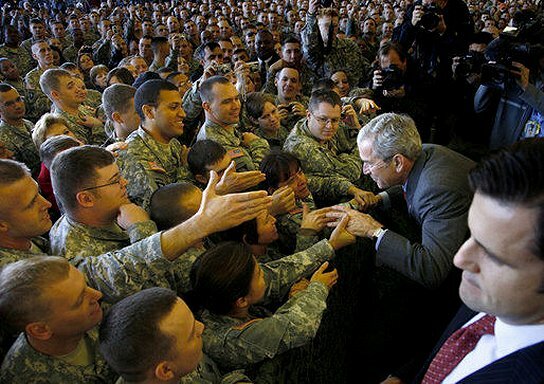 You can really see the love and respect our beloved troops have for President Bush. God bless them all. 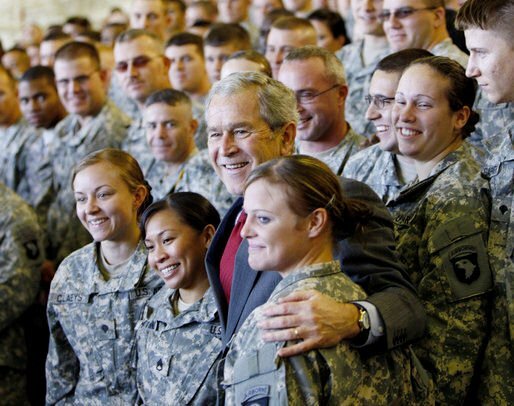 As a whole, the troops still love Bush as they know he's doing all he can to make America safe. I wonder how the troops will react to Obama. I already know one officer who dropped his retirement paperwork for a January 1 retirement date to beat the deadline. Come February 1, Obama's name will be on retirement certificates. I got Clinton's on mine. The units from Ft Campbell have certainly taken their share of casualties in the War on Terror. These troops know what needs to be done. Yes, these troops and all our military know that President Bush is doing what needs to be done. They know the he has taken extreme heat from the peaceniks, Dums, Dems, MSM, and other liberals for our military efforts. My guess is that most of the military is not optimistic about the future under Obama.